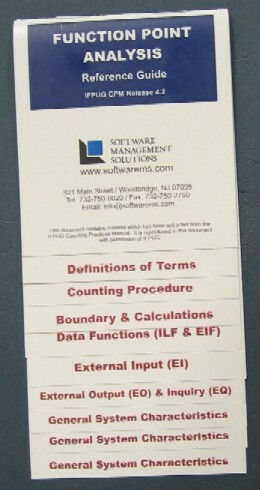 If you count function points then you must have a function point reference card that is easy to use. SMS has one of the most comprehensive and easy to use reference cards available in the industry. It is updated to reflect the Counting Practices Manual (CPM) Version 4.2 - Part 1 Rules with an accompanying trifold that summarizes Part 2 of the CPM. The rules reference card is a flip card with clearly marked taps for each section. To order the reference card download, complete and return the order form. 1. Definitions of Terms: definitions of 10 of the most commonly used terms in function points. To order reference cards for you or your organization please download the order form and return to SMS. You can also download, for FREE, a file which can be turned into two folding reference cards (one for counting rules and another for General System Characteristics). Simply download the folding FP Reference card, print two-sided it on a card stock paper, and fold it for your use.